Amma Ghar’ is a children’s home that was carved out of Mission Ashra’ on Dec 25, 2015 with the objective of providing a congenial and open environment for the children to grow and blossom. The home was inaugurated by Collector – Khorda, Mr. Niranjan Sahu. This was a long standing issue but owing to economic constraint the decision got delayed. Currently it houses 32 children, People’s Forum collaborated with JSPL Foundation to provide basic infrastructural support including beds, kitchen setup and other essential equipments for the home. 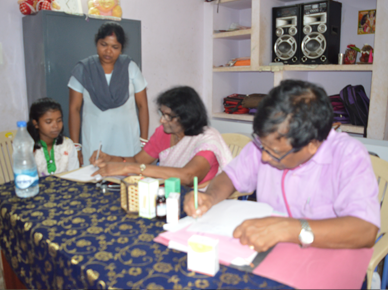 Visit of Medical professional on a monthly basis – A senior Pediatrist visits the home twice a month to assess the health condition of the children and provide them medical support as and when necessary. Regular visits to schools of the children to ascertain their problems. Progress and other issues.